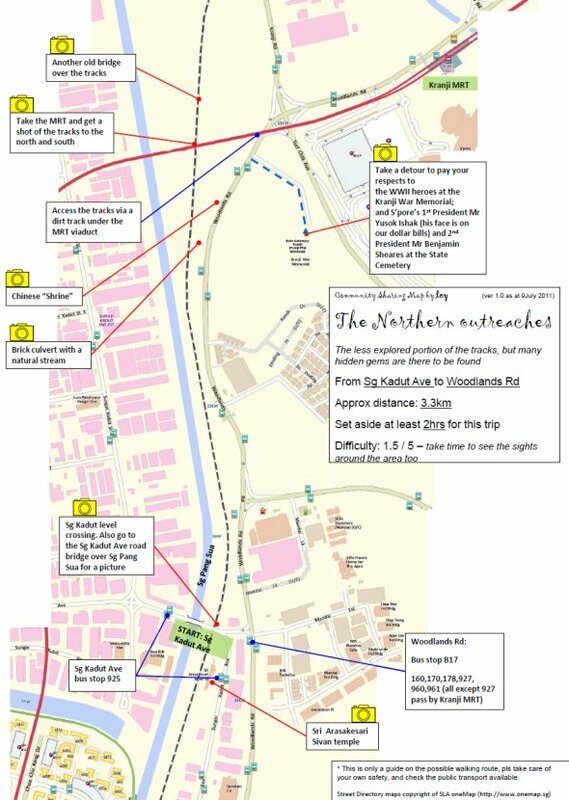 Here’s a map of the The Northern Outreaches – Walking route from Sungei Kadut Avenue to Woodlands Road, which includes good photo-taking spots. Thanks to the great effort from CY Leong! The restricted area begins 200m or so further north than you show i.e. closer to the checkpoint flyover. It is marked with a huge No Entry sign which you can walk right up to. There is a path next to it (on your map) which leads out via a hole in the wire fence to Woodlands Road. The best entry point is the Kranji road level crossing. 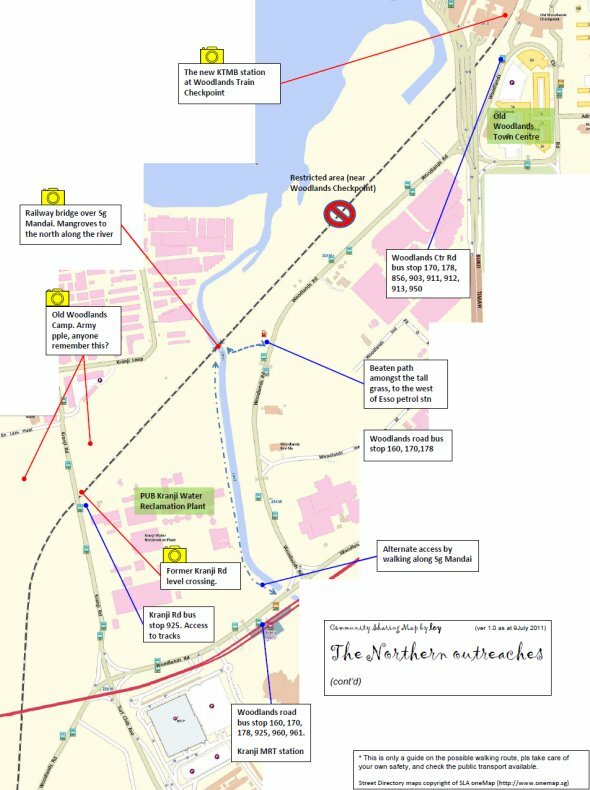 All other entry points (dirt path under MRT viaduct, access via Sg Mandai and the beaten path west of ESSO station) are now overgrown with tall grass and will make it quite difficult to “bash” through without proper attire (especially important for people with skin allergy). I entered the corridor via Kranji road level crossing which is well maintained, and it even has a sign board indicating the entry point. Cycling along the corridor on a mountain bike with front suspension is quite ok and not too bumpy overall if you do not ride too fast. The corridor is quite well maintain with grass trimmed. There are 2 “obstacles” (tree trunks across the path) along the way to Stagmont Ring Road. They are not a big deal actually and can be negotiated. The original bridge over Sg Mandai is removed. There is an alternative bridge now, a few meters inland, however, from there you can’t seem to be able to come back to the path towards the checkpoint, so we ended our journey there and walked from there over a path to the bus station next to the Esso. The old bridge crossing the former railway just north of the crossing with the red mrt line is simply gorgeous and that stretch was so beautiful. We didn’t run into anyone else there, very quiet and peaceful.